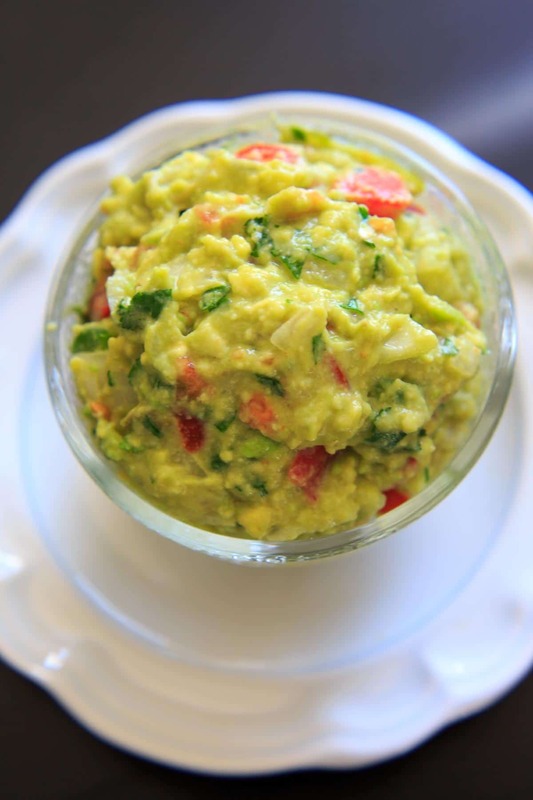 The BEST EVER guacamole recipe that’s a little spicy, full of flavor and naturally vegan and gluten-free. Includes tips on how to make it your own if your taste buds can’t handle cilantro or spicy. Obviously this is subjective, but I’m declaring this guacamole the best. Ever. I’ve eaten a lot of guacamole in my lifetime. Everybody has their own way of making it. 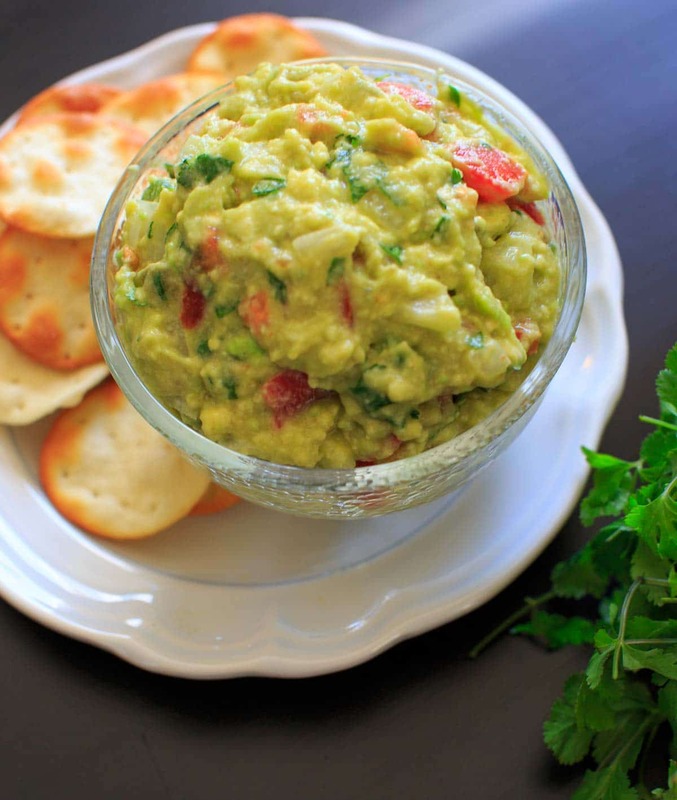 The most basic guacamole you can make is mashed avocados with a little bit of salt and lime juice. I’ve even met people who don’t use lime juice, but they are MISSING OUT. I’ll admit I’ve made the above poor-mans guacamole in desperate times. But the first time I made it with onion + tomato I knew it would be hard to go back. Now the one thing I know will cause a debate is using fresh cilantro. I’ve heard different statistics, but it appears about 10% of the population absolutely hates cilantro. My dear friend Lauren (hi Lauren!) is one of these people. Apparently to her and one out of every ten of your friends thinks cilantro tastes like soap. It’s actually a genetic mutation. Or I guess genetic variant is the better word. If you want to read some science-y explanation about it you can read about it here. Me? 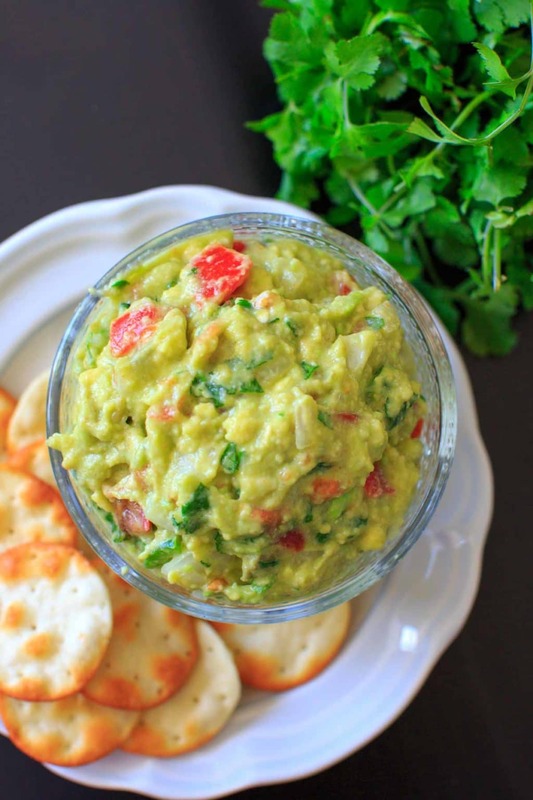 I love the flavor that fresh cilantro gives this guacamole. BUT I also tried it without, so I know that it still has a ton of flavor for those of you who want to leave it out. I also add some diced jalapeno in for a little heat. Optional if you don’t like it spicy, but you know I can’t resist. Personally without the cilantro and jalapeno I liked to add a dash of garlic salt (obviously completely different things but it added an extra spice). So the “core” ingredients here are ripe avocado, lime juice, white onion (red onion would work as well), tomato, cumin, salt. Jalapeno + cilantro are optional but highly recommended if your taste buds can handle it. Use it as a dip, slather on some enchiladas (recipe coming soon!) or just eat by the spoonful. PRO TIP: If you add a little bit of avocado oil, you’ll not only get the nutritional benefits but it will add to the texture. 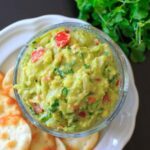 The BEST EVER guacamole recipe that's a little spicy, full of flavor and naturally vegan and gluten-free. Includes tips on how to make it your own if your taste buds can't handle cilantro or spicy. Add avocados and lime juice to small bowl and mash with a fork. Stir in diced white onion, chopped tomato, cilantro and jalapeno if using. Add cumin and salt to taste and combine. Best served fresh but can be stored in airtight container in refrigerator for a couple days. I love all of the flavors you’ve added to this, from the lime to the jalapenos! I can’t wait to try this! Thank you for sharing. Luci’s Morsels | fashion. food. frivolity. This sounds YUMMM! I can’t get enough guacamole! I love making it at home, but there is an ‘authentic, Mexican restaurant close to my office that makes a guac that is beyond good. It does look really good. I’ve not made my own guacamole for such a long time. I really must. I’ve made this basic recipe for many years. 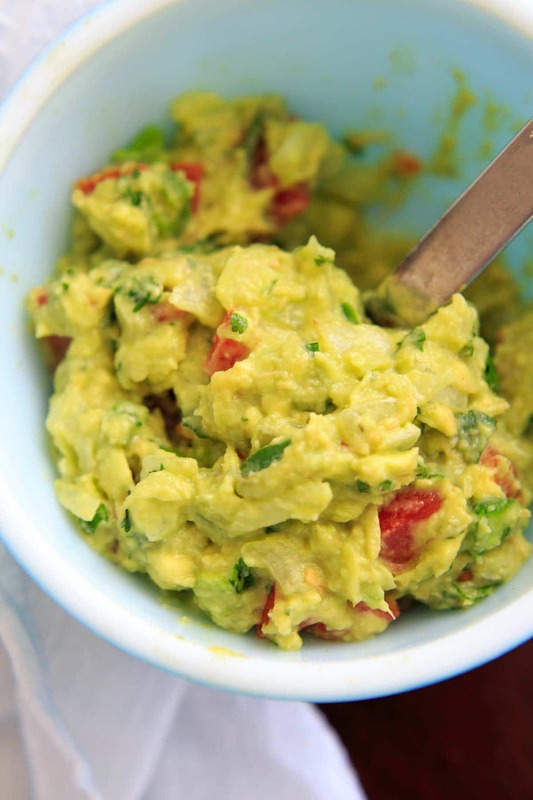 And I agree this is the best guacamole. Years ago w hen I first made guacamole ,didn’t add the tomato. As they say you can’t go back. I too don’t add the cilantro ….it doesn’t like me. Thank you sharing your recipe. It’s very addicting, isn’t it?! Sorry to hear cilantro doesn’t agree with you, try some parsley next time and see if you like that!